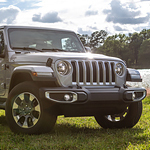 Drivers who have been eyeing the development of the new Jeep Wrangler will be pleased to learn about its capability features. It brings handling and comfort to the forefront of its design, providing individuals with an incredible way to cruise for business and pleasure. To begin, the incredible traction system allows individuals to handle some of the most unpredictable driving conditions. Carefully calibrated technology lets drivers transfer power to the ground much more efficiently than with older models. The Wrangler is also available in three different 4x4 options, which can allow drivers to specialize for their needs. If you are interested in test-driving this vehicle in Athens, it is recommended for you to visit L & M Motors at your convenience. The professionals there can get you behind the wheel of a new Jeep Wrangler at a time when it works best for you.